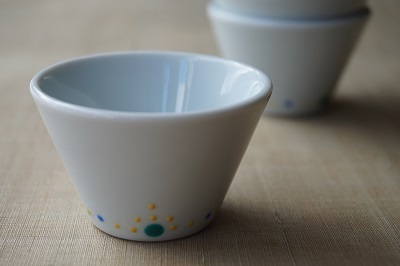 Today's item is a sake cup made by Shogaku TSUJI. which look like a firework or some illumination. 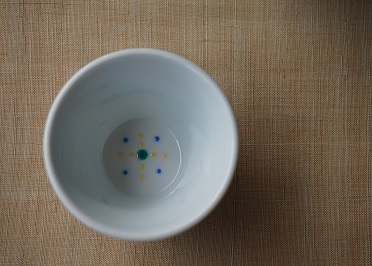 The colored-dots are clear and deep. That is the very Japanese colors, I think. Looking inside the item, you can see some paintings which may be seen at churches. 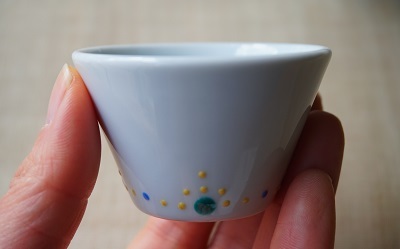 This very small item can be used not only as a sake cup but also as a bowl for small dishes or some seasonings. The family started in 17c when the Nabeshima clan set Akaemachi to gather artisans of red painting. however, now there are only 2 families left, the TSUJI family and the IMAISUMI family. and he has devoted himself to keep treasures of old fine porcelain in Japan.